Ko-Kutani or 'old Kutani' wares are distinguished by their brightly coloured and graphically strong decoration. 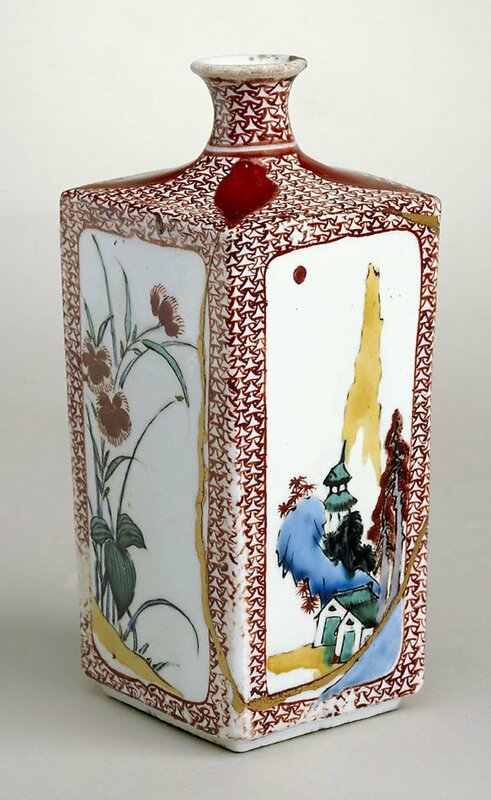 This square-shaped sake bottle, painted in overglaze enamels, is dominated by four panels of similar but not identical landscape and flower designs. The bright and unexpected green, blue and yellow mountains and rocks; the red trees and green pagodas, set against a brilliant white, are startling in their effect, as are the two panels of flowering 'nadeshiko' pinks. Ko-Kutani ware takes its name from the village of Kutani on the west coast of Japan's main island, Honshu, in Kaga prefecture. It was here, reputedly in 1661, that the Maeda clan began producing porcelain that was distinguished by its colourful overglaze enamel decoration. By around 1700 the industry had lost its vitality and the kilns closed. Early in the nineteenth century they were re-established to produce a later variant known as Ao-Kutani, or 'green' Kutani ware.